This page lists our picks for the best cycling balaclavas. All of these balaclavas will help to keep you warm during your cold-weather bike rides. This one has been a favorite with many cyclists for a long time. Like other more advanced products, it uses a combination of fabrics: 100% polyester with windstopper membrane for the forehead and ears, and a combination of nylon and elastane for the rest. 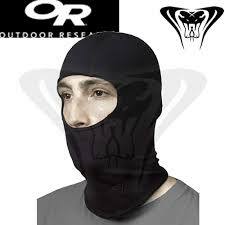 This balaclava has a meshed thermo-stretch panel over the mouth and nose. Most find this just fine for breathing, but I have heard of some cyclists who have increased the breathability by the simple method of sticking a ballpoint pen through the holes! It is lightweight, yet offers excellent cold protection. It can be pulled down below your mouth, once you heat up a bit on your ride. Buy it here from Amazon – its competitive price and great quality makes it an excellent pick. This cycling balaclava features premium design and materials, and is super versatile. Designed by a cyclist, it is a modular balaclava in two pieces, which you can use in various configurations. It can range from just a neck gaiter, all the way to full face coverage. The photo below shows me wearing this balaclava in two of the possible configurations. I use it for cycling and for cross-country hiking in snowy terrain. The Weatherneck System Balaclava completely covers the back of your neck with its unique “mullet,” and the face mask completely covers your throat. It fits smoothly under a helmet, and I find it very soft and comfortable. It wa invented and manufactured in the USA, and is a unique and premium cycling balaclava that is ideal for all outdoor winter sports. This is an interesting option. It’s very cheap but is extremely highly rated by many reviewers. It features a narrow slit for the eyes, and can be easily pulled downwards for air. The Trendy Swede Balaclava has an extra-long neck. It’s intended for fall and spring, rather than super cold winter days. For the price, you might want to get these as your fall and spring option, and have a thicker balaclava for winter. A great product for the price (buy it here from Amazon). It offers very good cold protection and ample neck coverage. There is a windproof face cover for complete protection, so only your eyes are exposed. In case you need more air, the mask is hinged so that you can easily pull it downwards. The microfleece makes it soft and toasty on your face. As someone who wears glasses, I sometimes have problems with my glasses misting up when air gets trapped in my balaclava. I find that with this balaclava, my glasses mist much less than with similar products. This makes it definitely worth considering if you are cycling in very cold conditions, where cycling glasses and a balaclava are both required. This one is an excellent product. The Pearl Izumi Barrier Balaclava is constructed from quality materials, as you would expect from this manufacturer. This is their balaclava for colder conditions. The one below is for slightly less cold conditions. This balaclava is easy to pull up and down over your nose and mouth. I really like that they have combined textiles, using a barrier windproof panel of 100% polyester for the part that goes over your forehead and ears, and a thermal material made of nylon, poly and spandex for the rest. The Pearl Izumi Transfer Balaclava is meant for slightly less cold conditions, and has good wicking ability. I think it is an excellent option. However, it might not be warm enough for freezing conditions.